May 21 2018. It is less than two weeks to Race Day on June 3rd for the USATF Masters Half Marathon Championship hosted by the Dexter-Ann Arbor Run [DXA2}. We have over a hundred entrants for the Half Marathon already, but expect dozens more. There are already some intriguing matchups but there are, no doubt, more to come. David Angell, of the Roanoke Elite, finished 3rd overall in the Half Marathon last year in Orange County California, but the two who finished ahead of him were both from the West Coast and might not make the trip. 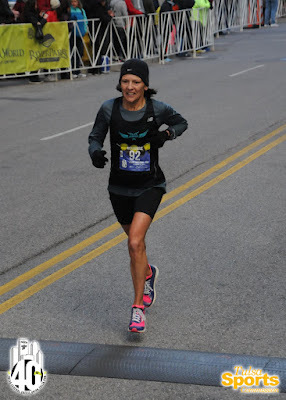 No slouch, Angell ran 1:12:18 on a course that turned out to be tougher than it was billed. He ran 1:09:37 in the Richmond Half Marathon in 2016. Will there be a Great Lakes challenger who could slow Angell down as he seeks to add the Half Marathon title to the crowns he already has this year for the 8K and 10K? There is at least one, Run Minnesota’s Olivier Vrambout, fresh off his Masters victory at the Fifth Third River Bank Run. He strode through the Half Marathon split in 1:12:57 on his way to victory in 1:26:42 and a victory margin of over two minutes. Vrambout also enjoyed a top five finish at the 2017 California International Marathon in 2:29:04. It looks like there could be a real duel. Who else will be in the pack? Philippe Rolly has been chasing Angell at Club Cross Country in Lexington, the 8K at Virginia Beach, and the 10K at Dedham. He has not caught him yet. But the Half Marathon may be a better distance for him. He ran 1:13:19 at the RnR HM in Philly last September and then won the Masters title at the Bank of America Chicago Marathon in 2:34:29. 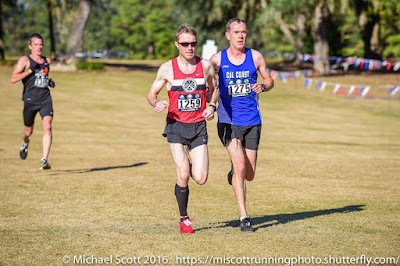 Sam Teigen, who was only two minutes back from Vrambout in Sacramento has run very well recently in finishing 5th overall at the 8K and 4th at the 10K Masters Championships. He will surely try to stay in the lead pack. Jonathan Frieder has been having his usual good season on the roads. He just ran 53:48 at the Blue Cross Broad Street Run (10 Miles) but has been a few strides back from Teigen in recent races. Frieder will definitely be up there at the start. But it may not be too long before he will have to make a choice, whether to risk everything for a spectacular individual result or to focus on team and age division goals. Greg Mitchell, who has been absent from our Masters Road Championships for a while, will toe the starting line as well. The 2014 and 2015 Masters Grand Prix 40-44 Champion, Mitchell has won National Championships at every distance from the Road Mile to the 15K. He will be going for his first national Championship at the Half Marathon; he finished 2nd to Kevin Castille in 2014 in 1:08:21. This spring he took Masters titles at the Mountain to Fountain 15K in Arizona in 48:55 and Portland Oregon’s Shamrock 8K in 24:50. He took 2nd Masters at the prestigious Carlsbad 5000 in 15:30 and on Lilac Bloomsday’s tough 12K course in 39:58. It looks like Mitchell is ready to roll. It is not as interesting yet on the Women’s side of the entry list. Melissa Gacek is the headliner but there is no one, yet, to challenge her. Gacek just claimed 2nd Masters at the 5th 3rd River Bank Run, speeding through the Half Marathon in 1:25:10 on her way to a 1:41:22 25K. And that’s with only 4 week’s training outside, after their last big snow in the Twin Cities. 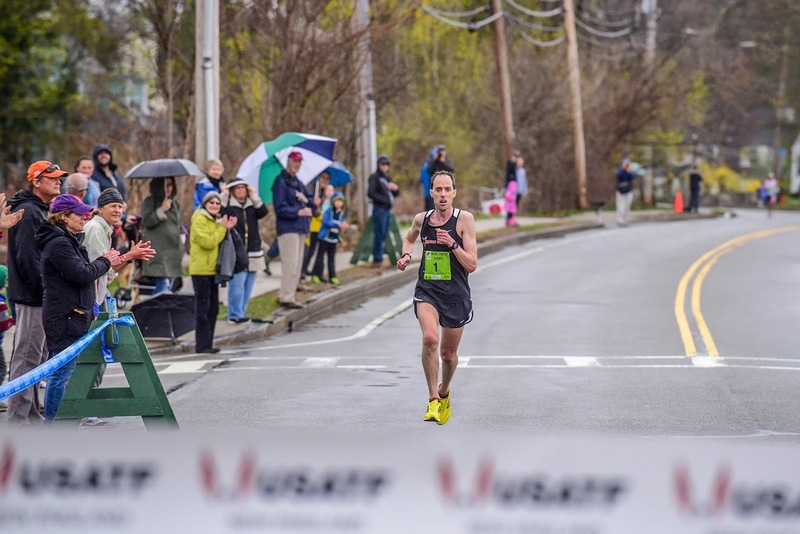 The only one to beat her in the 25K was Jennifer Bayliss from California, just after winning her 2nd National Masters Championship this year in the10K at Dedham. It seems unlikely Bayliss would make another trip to Michigan so soon, but Gacek would surely enjoy a rematch with a few more weeks of workouts under her trainers. Another possible entry might be Tammy Nowik, who hails from Michigan, and just finished 3rd behind Gacek at the River Bank Run. Like Gacek, she probably can also benefit from the added weeks of outdoor training weather. There are at present a few likely contenders among both Women and Men. For the men, there are Rick Becker, Gene Dykes, and Roger Sayre. Becker topped Nat Larson in age grading at the USATF Cross Country Championships in Tallahassee FL and that has not happened often. Becker is a terror on the Cross Country paths, but he has also done well on the road race circuit, finishing just behind Brian Pilcher and Larson at the 10K in Dedham in 2016 with a 90.93%. Dykes is new to top age-grading performances in National Championships, but he has been on a tear this spring. He finished 2nd to Larson in Age-Grading at the 10K with a 92.90%. For the Women, we have Jeanette Groesz, Doreen McCoubrie, and Suzanne Ray. At the 8K in Virginia Beach, it was McCoubrie, Groesz, and Ray, finishing 3rd 4th and 5th, at 91.87%, 91.82% and 90.21%. But on the tough, cold 15K run in Tulsa last October, the order was Ray. Groesz, and McCoubrie. How will it come out this time? Ray should be looking to bounce back and one would say the longer distance might suit her, given the 15K results. But McCoubrie is very strong at the longer distances. 40-44 Angell, Mitchell,Teigen, and Vrambout should have quite a battle for the Overall win and the 40-44 division. So far Gacek is solo in her division. 45-49 Jonathan Frieder will try to see if he can catch Philippe Rolly. 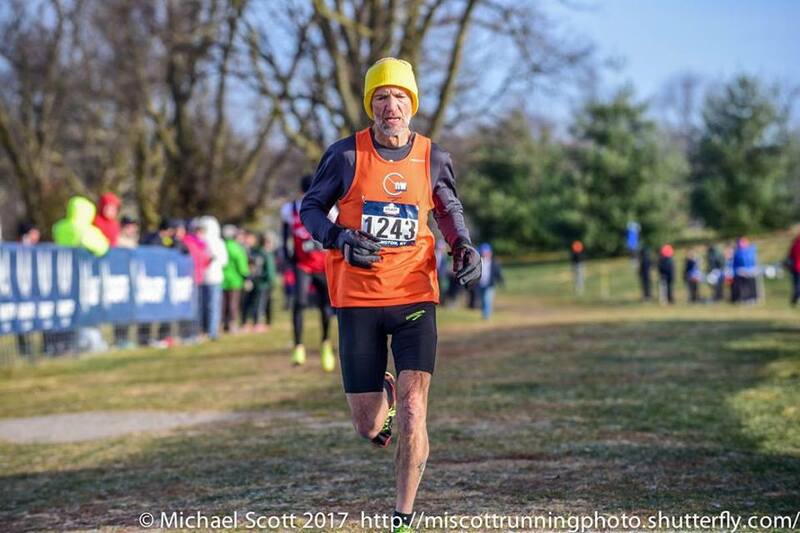 Forty-four seconds back at Club XC, 12 seconds back at the 8K Championships and only 2 seconds behind at Dedham, perhaps Ann Arbor will be the site where Frieder can close the gap all the way. Brent Fields has not quite been up to their level in recent months but shold be a good bet to make the podium. Teammates Caroline Bucci and Melissa Senall are set to vie for 45-49 honors. Recently Senall has been a few steps ahead of Bucci, so she is the favorite as of today. 50-54 The Genesee Valley Harriers are sending a strong contingent. If up to his normal fitness, Alan Evans might be the favorite. Evans ran 2:52:16 at Grandma’s Marathon last year and the year before ran a 1:19:46 at the Skunk Cabbage Classic HM. Mike Nier, his teammate, is usually a few steps ahead of Evans at shorter distances but a Half Marathon is a bit of a stretch. Still, he ran 3:23:14 at Boston in the very hot weather of 2017. Dale Flanders ran 1:22:56 in the Hooters to Hooters HM last year so he could make it onto the podium if things break his way. Two who might get in the way of the GVH crew are Paul Mayer of the Ann Arbor TC and Eric Stuber of Playmakers Elite. 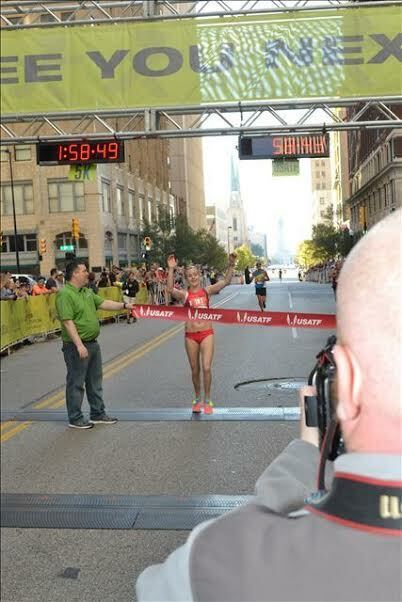 Mayer ran a 1:21:00 at the Rite-Aid Cleveland HM last year and a 1:02:40 at the Crim 10 Miler. Stuber ran a 1:18:53 at the Gasparilla HM in February of 2016 and in September of that year, ran 1:22:08 in the Capital River Run. But his most recent HM was in Florida in February when he ran 1:32:49. Otherwise Stuber has the fastest HM time of the bunch within the last two years. Hot off the presses; Stuber just ran 1:21:54 at the Flying Pig HM in Cincinnatti; that indicates current fitness at this distance. I will give the edge to Stuber because Mayer does not appear to have any races beyond 5k this spring. But there is no doubt it will be a real battle. Dana Blum of the Impala Racing Team and Kris Huff of Atlanta appear closely matched. Blum ran1:37:20 in the Kaiser Permanente San Francisco HM earlier this year while Huff ran 1:37:41 in the Publix Georgia HM. They are the class of the field at present and it looks lie it would be quite a tussle. 55-59 Dennis Kinney, Gary Leaman and James Zoldy might well be the three to beat based on current entrants. Kinney’s claim is perhaps the more tentative being based on a 1:24:01 in the Flower City HM in 2013. Updating that to age 57 with the age-grading tables suggests it is equivalent to a 1:27:54 which would put him in the hunt. Leaman has a 1:27:00 in the Shades of Death HM and 3:15:52 in Boston this year (near gale conditions) and a 3:18:13 last year when it was so hot. But if one goes strictly on HM times, Zoldy should be the favorite. He ran 1:22:43 at the HM Championship last year in Orange County California and has other HMs in the 1:23 to 1:26 range. Doreen McCoubrie is clearly the fastest of the current entrants. She won last year’s HM championship in Southern California in 1:29:33 and ran 3:17:26 in Boston this spring. Kelly Dworak is probably number two right now based on a 1:12:39 10 Miler and a 1:38:13 Half marathon. Beth Ann DeCiantis and Janet Smith should not be too far behind Dworak. I will give the edge for now to Smith whose 1:14:35 at the Norcal JF Memorial Run (10 Miler) is age-grade equivalent to a 1:38:32 HM. But De Ciantis ran a 2:19:29 18 Miler which is AG equivalent to a 1:40:10, so there is not a lot of space between them. 60-64 Rick Becker, Roger Sayre, Dave Walters, and Michael Young are the four from a strong field who are most likely to battle for the three podium positions. Known for his fierce runs on the Cross Country circuit, it appears Becker is now fully recovered from his operation in early 2017. 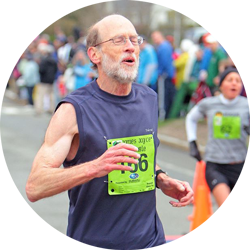 He recently clocked a 44:26 at Lilac Bloomsday, which is known for its strenuous 12K course; that time is age-grade equivalent to a 1:19:54. Sayre, in the meantime has run a 55:29 15K on the tough, hilly Tulsa Run course, age grade equivalent to a 1:18:58. He has also run 2 sub 1:20 Half Marathons at altitude in Colorado. Those two seem most likely to duel for the win but Walters and Young will not be far behind. Walters ran 2:51:39 at the TCS NYC Marathon and 2:53:27 at the BOA Chicago Marathon, not to mention a 1:23:29 at the March Madness HM. Young has similar credentials, with a 2:57:26 Tucson Marathon and a 1:24:35 at the Rock CF Rivers HM last year. Patrice Combs appears to be a pretty safe bet in this division, at least with current entrants. She just took this division handily in Dedham at the 10K Championship in 43:09; that is AG equivalent to a 1:33:27. She validated that by actually running a 1:34:26 in the Publix Georgia HM. Lyn Bernot of Team Red Lizard is the 2nd favorite based on her 1:47:08 in the Holiday HM in San Diego and her 1:15:08 in the Portland Shamrock 15K, AG equivalent to a 1:46:42. Cheryl Guth and Joanna Harper may have the same kind of attle for the last podium spot that they had in Dedham where Harper edged Guth by a single second. 65-69 Among the entrants thus far, John Hirschberger, Jerry Learned, Eduardo Matsuo, and Terry McCluskey appear to be the strongest Half Marathoners. Hirschberger ran 1:34:31 in the HM Masters Championship last May. This spring he has a 34:50 at the 8K National Championship and a 1:14:20 at the Norcal John Frank Memorial 10 Miler. That is AG equivalent to a 1:38:31. But then last fall he ran 1:32:12 at the Clarksburg Country HM. Learned is a very steady runner and is running very well over the last couple of years after putting some injuries behind him. Nonetheless, this appears to be a little bit of a stretch in distance for him. He ran a 1:06:58 at the 15K Championship in Tulsa, AG equivalent to a 1:35:29. He came in 21 seconds ahead of Hirschberger in the 8K Championship at Virginia Beach. Matsuo ran just a little bit faster at Tulsa, clocking a 1:06:03, AG equivalent to a 1:34:05. He also has some home course experience, having run the DXA2 in 1:34:42 in 2015. Finally there is McCluskey who is easing back into Masters Championship events before turning 70 this summer. He finished half a minute ahead of Learned, despite losing some time at the beginning of the 8K race in Virginia Beach. His 1:09:03 at the Crim 10 Miler last August is AG equivalent to a 1:31:34. That kind of time may be out of reach as his time this spring in the Cherry Blossom 10 Miler was 1:11:06. Nonetheless, unless someone else enters, I make McCluskey the favorite; he beat tow of the other three in the 8K and has a faster 10 Miler time than Matsuo’s 15K. Plus McCluskey is a 3-time Age Division Runner of the Year. Suzanne Ray, Jeanette Groesz, and Victoria Crisp are all strong runners. With the exception of the 10K in Dedham last month, Ray typically comes in ahead of her teammate, Groesz, although Groesz typically gets the age-grade edge. Ray ran a 1:37:15 HM this year along with a 1:15:14 in the Pear Blossom 10 Miler, equivalent to a 1:39:25 HM. Crisp ran a 1:42:10 HM this year, a race that she ran in 1:39:48 last year. Groesz’s best recent effort over a comparable distance is her 1:14:07 at the 15K Championship in Tulsa. That is equivalent to a 1:45:14. That is a tough course, so perhaps its true equivalence is a bit lower than 1:45. Still it appears Crisp seems likely to come in ahead of Groesz. 70-74 If things continue as they have been going this spring, Gene Dykes is a heavy favorite to take this division. He ran 2:57:43 at the Rotterdam Marathon, taking down the American Record, and then at Dedham took down the American 10K record in 39:04. It is rumored that Bill Dixon might enter but if so, he will most likely be gunning for 2nd place. In Dixon’s absence, Dave Glass and Lloyd Hansen should battle for 2nd and 3rd. Glass won almost every race last fall and Hansen is trying to regain the fitness he had in 2014 when he was 65-69 Runner of the Year. Last October in Tulsa, Glass ran 1:06:15 to Hansen’s 1:06:46. Glass’s recent 3rd place finish at the 10K Championship in Dedham in 43:49 suggests he is close to that fitness now. Hansen just ran 53:15 on the challenging Lilac Bloomsday 12K course. That is equivalent to a 1:35:56 and maybe a bit faster adjusting for degree of difficulty. That suggests Hansen might be able to run faster than the 1:35:51 he posted in last year’s championship. I will give the edge to Hansen because he has run more HMs recently than Glass but it is likely to be close. Gene French, Przemek Nowicki, and I are all at various stages of rehab so will probably not land on the podium. There are two entries, Jo Anne Rowland and Irene Terronez. Even though Rowland is coming off an injury, it appears she should still be able to take the division. Not up to her former standard, Rowland still was able to run 1:51:44 at the Clarksburg Country HM last Fall and her 39:32 at the 8K in Virginia Beach suggests she should be able to run around 1:50. She ran 1:43:35 at the 2016 Masters HM Championship by contrast. Terronez, in that same race, ran 2:21:44. She took 2nd at last October’s 15K Championships in 1:39:03. 75-79 Robert Hendrick, who won this division at the USATF Cross Country Championships in Tallahassee and the 8K at Virginia Beach, was hoping for a rematch with Doug Goodhue, who took the division title in Dedham at the 10K. Unfortunately, as Race Director, Goodhue has too much on his plate. He had hoped to run, but duty calls. With Goodhue out, Hendrick should have clear sailing for the win. He ran 1:41:27 at the Ft. Lauderdale HM and anywhere near that will give him the win. David Cohen and Charlie Patterson should have another great duel for 2nd and 3rd. Cohen ran 2:02:01 at the RnR HM in New Orleans in March, and just clocked 53:02 at the 10K Championship in Dedham. That is AG equivalent to a 1:55:17. Charlie Patterson ran 1:56:14 in last year’s HM Championship in Orange County. Patterson did not compete in the 10K Championship this year but he did run a 12K in mid-February in 1:07:12. That is equivalent to a 55:33 10K. But that suggests another two months of training might bring Patterson and Cohen pretty close. Last summer, Patterson beat Cohen by 4 seconds at the Road Mile Championship in Flint Michigan but then Cohen beat Patterson by 6 seconds in the 15K Championship in Tulsa. I will give the edge to Cohen for having won the longer of the two races, but look for another tight contest! It is hard to say much about teams until they are set in the final week. Men’s 40+ has only one complete team, the Garden State Track Club-New Balance. The same is true for the Genesee Valley harriers in the Women’s 40+ division. Men’s 50+ has more complete teams. It appears that GVH has a slight edge over Playmakers Elite and Ann Arbor TC. Stuber just ran a 1:21:54 in Cincinnati at the Flying Pig HM. That suggests it will be really tight between Ann Arbor and Playmakers for 2nd and 3rd. It looks like the top runner for each time is very close and it is hard to call the race between #2’s and #3’s; in fact it is hard to know who is #2 and who #3 on each team. If Lambrecht can crack 1:30, that would probably give it to Playmakers but that may be a tall order. Women’s 50+ has 3 complete teams and one that the rest hope stays incomplete. Athena TC has only Doreen McCoubrie entered right now. If she is joined by some of their other distance specialists like Teri Cassels and Mary Swan, they become the favorites. In their absence, Dana Blum and Janet Smith should lead Impala to victory. Atlanta and GVH would then strive for 2nd and 3rd. Atlanta looks to have the stronger #1 with Kris Huff who should crack 1:40. But if Carol Bischoff can come close to her 1:43:49 at the NYC HM and if Beth Anne DeCiantis can run close to 1:40, that should give the edge to GVH for 2nd place. Like 50+ the Men’s 60+ race will be a ‘barn burner.’ Boulder is sending a strong contingent. If Roger Sayre is fully recovered from his Boston Marathon ordeal, he should be able to crack 1:20 and lead the Boulder contingent of Martin Lascelles, George Braun and Nate Anderson to victory. But first they will need to get past Atlanta. The trio of Ken Youngers, Mike Anderson, and Phil Richey have helped Atlanta take Boulder’s measure at both the 8K and the 10K. But neither Youngers nor Richey is entered yet and Mike Anderson is not at peak fitness. Perhaps Atlanta will not field a complete team? The other three teams, Ann arbor, GVH, and Shore appear to be pretty close. After Boulder, I give the edge to Ann Arbor TC. But every runner will need to do his best. If Michael Young can come in under 1:25 and if Eduardo Matsuo and Terry McCluskey can both hit 1:35 or better, they should claim 2nd, a few minutes ahead of Shore AC If Stirrat and Dollard can average 1:30 between them and if Scott Linnell can stay under 1:40, Shore should claim 2nd just ahead of GVH. The one chance for GVH seems to be if Rybinski’s fitness is continuing to improve and he can somehow crack 1:25. It is a tall order but then GVH might have a chance at the podium. Team Red Lizard is entering their usual sterong tri of Jeanette Groesz, Joanna Harper and Suzanne Ray. They will be the favorites even if GVH can field a complete team to contest the division. Men’s 70+ looks right now to be a battle between the Ann Arbor TC and Atlanta. If Lloyd Hansen can stay close to or beat Dave Glass, and if I (Paul Carlin) can come in ahead of the rest of the Atlanta crew by a few minutes, then David Cohen should finish off our scoring well enough to cement the win. I have been trying to right my downward spiral and feel like I am turning the corner, but my fitness is way off where it would normally be. Still I should be able to come in under 1:50 and that might be enough; I hope to crack 1:45. I won the 70-74 division last year in 1:41:42. That is the early preview, the best I can do with limited information on who will contest the races. I will offer an update when we are closer to the end of online registration the 30th of May. That is only 9 days away. If you sign up early, that makes my preview job easier. And it takes one more thing off your mind.